On September 15, 2012 people in 25 countries, will take part in the “World Wide Views on Biodiversity” event. The project will engage citizens in making policy recommendations and awareness raising to sustain a living and healthy planet. Outcomes will be presented at Convention on Biological Diversity meeting in October. EOL tools and resources are being used in educational activities that will extend these conversations to the broader public. Biodiversity, or biological diversity, means the number and different kinds (or species) of plants, animals fungi, and microorganisms living in an environment, such as a lake, coral reef, or forest. 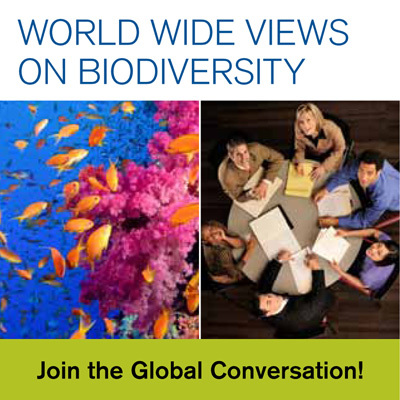 On Saturday, September 15th 2012, thousands of citizens from across the globe will come together to voice their opinions, engage with global policymakers, and discuss biodiversity in a day-long event called World Wide Views on Biodiversity. The outcomes of this global deliberation will inform representatives at the United Nations Biodiversity Conference to be held in India from October 8th-19th 2012. As one of the host sites for this global deliberation, the Museum of Science in Boston has created supplementary biodiversity activities for members of the community who may not be attending World Wide Views on Biodiversity. These activities aim to raise awareness of and spark conversation about biodiversity. For museum visitors, Choose Your Own Biodiversity booklets are available at the museum. These exciting, interactive tours showcase the wide variety of species represented in the museum’s collections, as well as connect visitors to these species in surprising ways. Additionally, the Museum of Science has teamed up with the Encyclopedia of Life to create activities that will enable citizens to discover the biodiversity present in ecosystems around their own neighborhoods. In a series of biodiversity quests, participants can identify and make connections between species in forests, fields, freshwater marshes, parks, and urban areas. These quests are available for download HERE. Participants can enter their observations online, as well as track other participants’ observations not only around Boston, but also potentially around the world.